Matt Engbring, a fire prevention officer with the U.S. Forest Service, checks on signs that alert the public to closures in parts of the national forest surrounding Flagstaff, Ariz., May 24, 2018. Dry pine needles and dead wood snapped under fire prevention officer Matt Engbring’s boots as he hiked a half-mile into the woods in search of a makeshift campsite that had served as one man’s home until this week when the area was closed because of the escalating threat of massive wildfires. FILE - In this photo by firefighter Andrew Ashcraft, June 30, 2013, members of the Granite Mountain Hotshots watch a growing wildfire that later swept over and killed the crew of 19 firefighters near Yarnell, Arizona. Forests in southern Colorado and southern Utah are open, but officials are limiting campfires to developed areas. Los Angeles residents John and Pauline Barba tidy up their campsite in Flagstaff, Ariz., May 24, 2016. The charcoal grills were off-limits because of extreme fire danger, and portions of the nearby national forest closed. 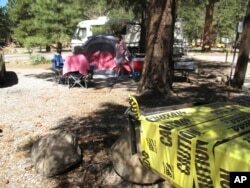 In Flagstaff, Los Angeles residents Pauline and John Barba had hoped to barbecue this week while staying at a commercial campground, but charcoal grills were wrapped in yellow caution tape.